Citrus trees grown in fancy terra cotta pots, light-weight decorative containers or wooden planters can be used to adorn your garden, no matter how small it is. Use a potted citrus as a centerpiece for an herb garden, place several in a series on your steps or decorate your deck with these grand-looking accent plants. Dark, glossy green leaves look beautiful all season long while colorful, healthy fruit dangles enticingly from the branches. Although citrus plants are not winter hardy in the north, they may be moved indoors during this time. For added pleasure, citrus offers weeks of fragrant flowers in the spring. Calamondin Orange – This cross between a mandarin and kumquat produces miniature oranges that are somewhat tart but make excellent marmalade. Ponderosa Lemons – Producing fruits that weigh up to a whopping 5 pounds each, Ponderosa Lemons have a thick ring with very little juice. Variegated Pink Lemons – This lemon has variegated foliage and produces a yellowish-pink fruit. Meyer Lemon – Although not a true lemon (it is said to be a cross between a lemon and either an orange or mandarin), the Meyer Lemon is one of the sweetest lemons. Key Lime – Also known as Mexican Lime, this selection is highly prized for making Key Lime Pie. The plant is very thorny and produces small aromatic fruits. Goliath Pummels – The largest of all citrus fruits, pummels taste similar to grapefruit. Blood Orange – Having an unusual red flesh, these oranges are prized by gourmet cooks for their slight berry-like flavor. Flame Red Seedless Grapefruit – This grapefruit variety produces medium-sized pinkish-colored fruits. Cocktail Trees – These are a grafted tree that usually contains 4 to 5 different types of citrus on the same plant, great for your own fruit salad in minimal space. Place citrus plants in a sunny location where they will receive a minimum of 6 hours of sun to ensure the best possible fruit. 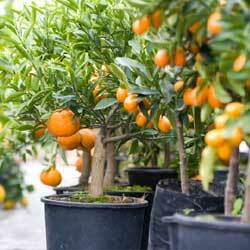 Water regularly and feed with a fertilizer listed specifically for citrus plants every two weeks. During the summer months, citrus plants will produce a lot of new growth. In the early fall, before bringing plants indoors, prune citrus plants back about 1/8 of their existing size. This will help to minimize the shock that plants often experience when being moved. Use a humidity tray indoors or mist daily. Avoid placing your plant in a drafty area or by a heating vent. Provide a minimum of 6-8 hours of daily sun or very bright light in the winter months. It may be necessary to supplement with an artificial light source at this time of the year to keep the plant at its best. It may seem unusual to have strange citrus trees in your yard or even right inside your home, but with a little care, you’ll be amazed at how much fun these plants can be to grow, and their sweet fruit is a wonderful reward for your efforts.